A few days after Abi died, we were already thinking about how we could somehow give something back to the people who helped her, and as a way to remember her life. It’s hard to explain why, while sat in a hospital waiting room with my daughter still with us, I had this urge to do something charitable. It wasn’t too strong at that point, I had a lot on my mind with Abi, but I recall ‘holding that thought’ as I felt it would be something we could do when it was over, whatever the outcome. Having seen the Wallace and Gromit Grand Appeal promotional material at the Bristol Children’s Hospital, it seemed an appropriate cause and we’d decided the best place for any donations. Abi died from a rare brain hemorrhage that only a CT scan would have picked up, and even still, it was in an inoperable location so she could never have been saved from her fate. The only reason the doctors agreed to operate on her was because she was a child – doctors are parents too – if she had been an adult, we later discovered, they would not have intervened at all. A heartbreaking prospect. To routinely CT scan people to pick up problems with the brain just isn’t an option for the NHS, as the health risks from the scan alone are greater than the chance of finding a weakness. And, in cases where a scan has picked something up, the patient has regretted knowing that they have this timebomb in their brain, as effectively their life, as they knew it, ended there. We were grateful that we didn’t know about this in Abi; there is no doubt that she lived a full, happy and carefree life. As nothing could ever have been done to prevent this, we didn’t see much benefit in fundraising for a brain haemorrhage-related charity, but found the work and facilities at the hospital were far more needed for children. We knew Abi couldn’t be saved, but the staff tried so hard and took great care of her. We set up a fundraising page on Justgiving to raise money for the hospital and published this on our Facebook pages. I knew from talking to friends that they wanted to ‘do something’, an understandable desire in the circumstances, so we asked that rather than send flowers people donate any flower money to the page. We set an initial target of £1,000 and circulated the link. However, we greatly underestimated the impact Abi’s death had on the community and, within a week, we’d exceeded that target. Donations poured in from friends, family, neighbours, clubs, work colleagues, schools, clients and strangers. There was a huge flurry of activity, from fundraising events to personal donations, so I upped the target to £5,000. But, yet again, this target too was quickly exceeded, within a few weeks, and it just kept going. It was quite incredible! Within three months of Abi’s death, we’d raised nearly £20,000! I say ‘we raised’ as though we went out campaigning or rattling tins, but we in fact did very little other than watch the figure increase daily online and post updates about how astounded and touched we were by people’s generosity. Groups of people and individuals went out on their own steam and used every opportunity to raise money and then donated online, or we had envelopes with money in pushed through the letterbox. Abi’s school friends in particular were quite remarkable. They’d just had this huge shock but were out in all weathers selling cakes, raising hundreds of pounds from this alone. They united in their grief for their friend and it was clearly so important to them that they felt like they were helping us in some way. 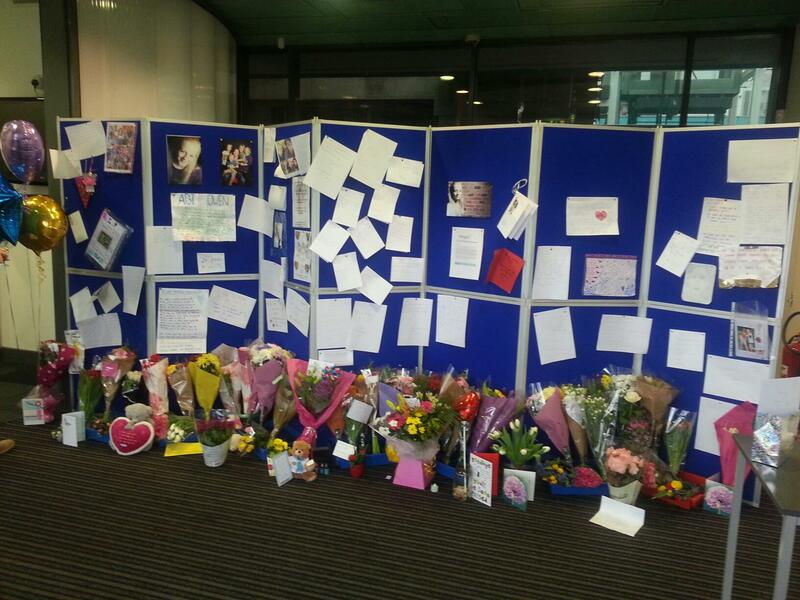 As soon as they heard of her death, the secondary school was flooded with messages, flowers and tributes – which the school kept in its foyer for a couple of weeks for people to visit. We learnt a lot about Abi’s friends during this time, and also about how special Abi was to them and we kept everything from this amazing tribute. 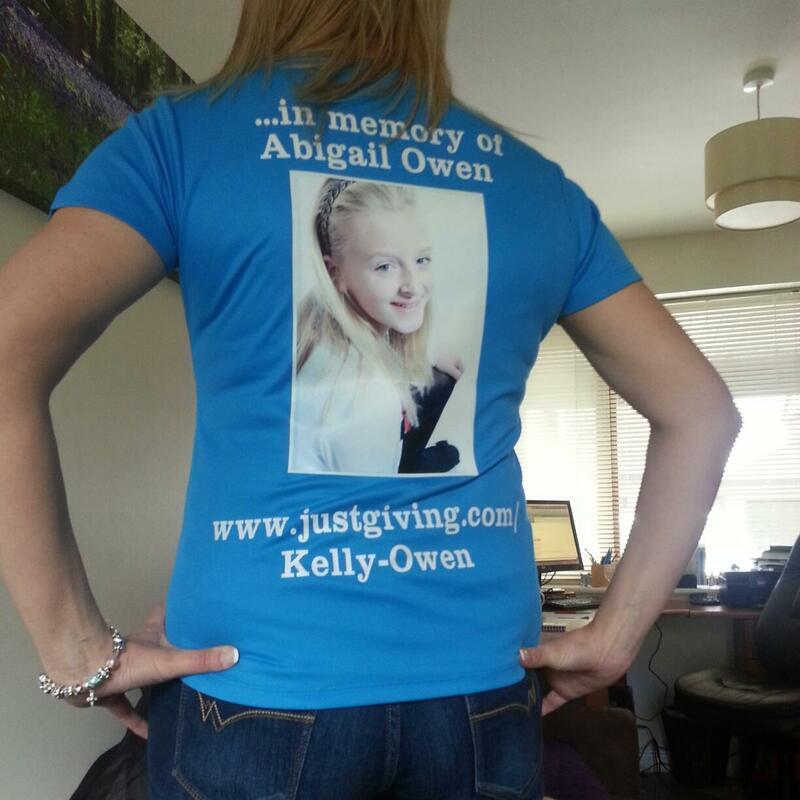 Even today, a year after her death, Abi’s fundraising committee at school (a group of her closest friends) will mark the occasion by doing some fundraising every day in the week – wear your own clothes day, chocolate raffle, cake sales etc. And her old primary school will be hosting a Winston’s Wish Great British Brekkie in Abigail’s memory, raising money for another worthy charity. It’s just remarkable what they can and want to do. I then decided to join the effort by running the Bristol 10k in the May, three months after Abi died, to raise money for the hospital. It was very hard and far too soon in reality for me to be undertaking such a positive act in light that it was my daughter who’d just died. I was exhausted from grief and out of shape; though the exertion of running did help me, it was hard to stay motivated. However, I had huge support from my running club and friends – all of whom did not hesitate to sign up to running over 6 miles and raise money in my daughter’s memory. Some were regular race runners, others had never run that far before or even been in a race, so it was a real challenge for them too. It was emotional to think of what they were doing for me. Around 30 of us ran the event that day, all wearing a distinctive personalised Abi t-shirt, which everyone paid for themselves. It was quite something. As I crossed the finish line, I felt a surge of emotion and gulped down tears amongst this huge crowd of runners. So many of the runners were doing it for a cause or in memory of someone. It was humbling but equally inspiring. When I got home I gave my medal to Abi – she loved me to be fit and active, like her, and would have been the first person at the finish line shouting me on. I’d never run such a large race before and it made me realise just how important fundraising is to people when they have lost a loved one or want to support someone who has. We need a purpose to somehow feel we can contribute to others not feeling the same pain. 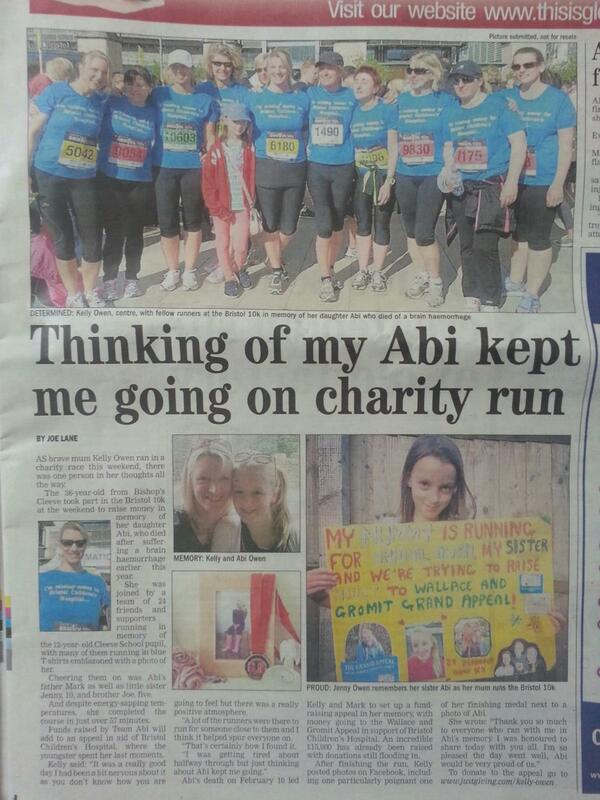 It was just one of the many stories about Abi which was covered by the local paper. To date, we’ve raised over £22,000 for the hospital so far! Abi has a special tribute star on the seventh floor of Bristol Children’s Hospital. It’s where everyone who has set up a Memorial Fund with the charity gets to be remembered and seen by others. We visited it after the run, and it was heartbreaking to see so many lost children on that wall and to see Abi among them was almost unreal. As a family, we are now Guardian Angels and donate a regular amount to the hospital each month – I see it as Abi’s ‘pocket money’ being used in her memory. Once I’ve had my baby, I’m sure I will look to get back in shape and undertake further fundraising for this great cause and get Abi’s t-shirt out again. The charity has already put the money raised so far towards significant improvements at the hospital. It is one of the largest children’s hospitals in the south of England and a great many children are treated there every day, so we know that in a small way we’ve helped contribute towards helping sick children, in Abi’s memory. Our time at the hospital was brief, but Abi’s legacy will last forever. That is something we can be proud of. 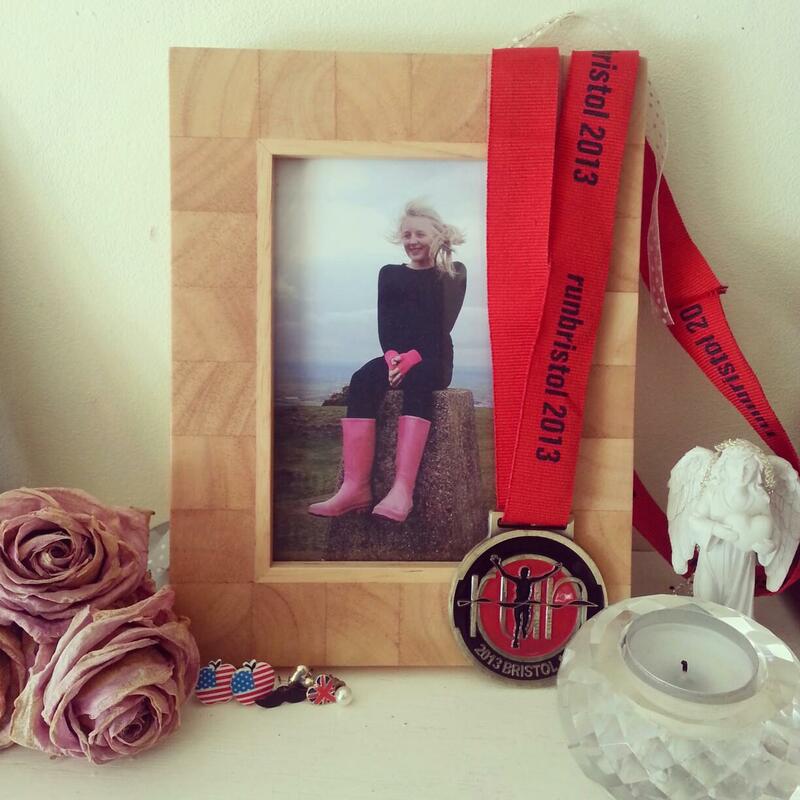 This entry was posted in Fundraising, Life with grief, Living and grieving, Remembering Abigail and tagged bereavement, charity, Death, family, fundraising, grief, life, loss of a child, support by Chasing Dragonflies. Bookmark the permalink.